Everybody nowadays uses smart plugs. A smart plug is a thing that you plug into the wall and then you plug something (maybe a lamp) into it. The smart plug typically connects to your wifi and from there to the Internet. Using an app on your smart phone, or using Alexa, you can remotely send a signal to the plug to tell it to turn off the lamp. Later you can send another signal to the plug to tell it to turn the lamp back on. Smart plugs are a lot of fun and you can do lots of interesting things with them. Now let’s talk about the cable or DSL modem that connects your office to the Internet (see figure at right). 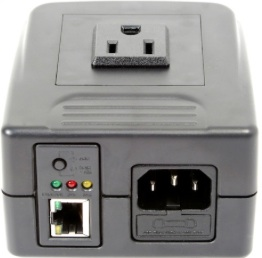 There is a main router the WAN port of which connects to that modem, and the LAN ports of which connect (directly or indirectly through ethernet switches) to all of the devices in your office. Although one hopes that it does not happen very often, the real-life situation is that every now and then one feels the need to power-cycle the main router and modem. Suppose you were to use one of the smart plugs of the kind that I just described, as a way to control the electrical power (shown by dashed lines in the figure) to the main router and modem. It turns out this would be a really unwise thing to do. Do you see why? Think about it. Suppose you were to use the app on your smart phone to send a signal to the smart plug, telling it to turn off the main router and modem. The situation at this point would be that you would never be able to send a signal to the smart plug, telling it to turn on the main router and modem. The reason being that the main router and modem are off. Meaning that the smart plug does not have any connection to the Internet. Meaning that if you had sent the “power off” command from some remote location, then to get things turned on again, you would have to travel in a car or airplane or train to the office location to turn things back on. So this explains why if you know what to search for, you can find a very specialized kind of smart plug, a smart plug where you can send a single command that tells the smart plug to turn off the controlled devices and then turn them back on. My favorite smart plug in this category is the EZOutlet2, shown at right. This smart plug connects to your network with a wired ethernet cable, not wifi. And you can send it any of three commands — turn the outlet off, turn the outlet on, and reset the outlet (which means turning the outlet off and then back on). The reset command is the only command that makes any sense if you have the smart plug connected to a main router and modem. To say this another way, if you were to have this smart plug connected as in the diagram above, you would never never never be using the “turn the outlet off” command (because that is irreversible). And you would never never never be using the “turn the outlet on” command (because that is impossible). The only command you would ever actually use is the “reset the outlet” command. Yet another really nice thing about this smart plug is that if you like, you can configure it so that it pings some predetermined IP address from time to time. You can configure it so that if the ping fails, the smart plug will power-cycle (reset) its outlet. 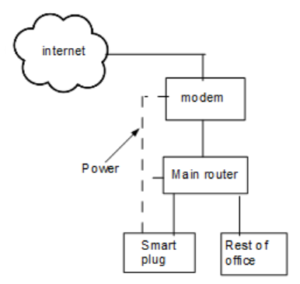 In the setup portrayed above, Ihave it configured so that the smart plug will be power-cycling the main router and modem if a ping fails. Hopefully this reset will restore Internet connectivity to the office. The smart plug can also be configured to carry out a scheduled reset, say once a week on Sunday morning. It seems to me that there are pros and cons to setting up scheduled resets of critical equipment like main routers and modems. I have never actually used this “scheduled reset” feature. Do you have such a smart plug set up in your office? By this I mean a smart plug that can respond to a single command by power-cycling its connected equipment? Maybe a smart plug that can do this in response to a failed ping? Maybe a smart plug that simply resets the equipment once a week regardless of whether the equipment actually needs to be reset? Please post a comment below. Carl, first “Ant-like Persistence” continues to be one of my favorite service marks – gives me a smile every time I see it. Interesting article, thanks. But I question the premise, “Everybody nowadays uses smart plugs.” (Clearly, you didn’t mean it literally, but I don’t use one for my office and don’t know anyone who does.) While the device you describe addresses the problem with conventional smart plugs, the problem itself demonstrates another kind of IOT risk, apart from hacking or unauthorized data collection and monitoring by untrustworthy service providers, etc. And, what if your smartphone is lost or hacked (although, arguably, anyone using a smartphone to connect to a smart plug is smart enough to adequately secure it)? But stuff happens. The convenience may be worth the risk for some, but maybe not for most. Very interested in hearing others’ thoughts. Very interesting, but I see a problem with the ping feature. What address will you use? If the address in unreachable for any reason that is unrelated to your modem and router, you will just end up with en endless loop of resets. Pinging an address within your network will not reset the system in case you lose internet access. Pinging an address outside of your network would completely disable your network if that address only, or a subset of the internet, cannot be accessed. It happens that servers, even from the most reputable companies, experience problems, or that problems make some part of the internet impossible to access.. The reset feature is also nice, but most useful when you have lost your internet connectivity. How will you then send the command? It would be useful however if you have two completely independent internet accesses. You control the power of access 2 through access 1, and vice versa. Maybe I’m missing something. I see that the reset feature has some uses, but will not eliminate the need for physically accessing the router once in a while, and the ping feature seems like a disaster waiting to happen if your favorite ping server is down, or simply not available through your ISP for example. I would love to be wrong as my router and modem are inconveniently located and having a way to reset my network without moving from my computer would be nice. Modern equipment is extremely reliable and I only need to reset my network a few times a year, but when I have to do so, I have to go to another building. One approach is to select the “next router” in the traceroute, by which I mean the closest one on the other side of the link to the ISP. With this, the ping is basically testing the link to the next piece of ISP equipment. If you are using cable Internet, this ping would be testing the connection to the CMTS. If you are using DSL, this ping would be testing the connection to the DSLAM. The smart switch has a setting for “how many times” it will do a reset before it gives up and stops doing resets. Now that makes sense. So, even if the internet is not available, my LAN is not unusable. I may just get myself one of these smart switches. For me, fortunately, my CURRENT ISP, firewall, routers, etc. are reliable enough that I am not sufficiently unhappy that I am willing to spend the time required to configure such a device. However, at various times in the past this would have been a very worthwhile work-around.